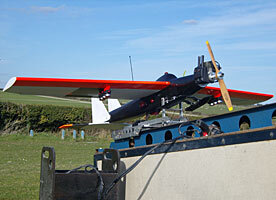 UAV (Unmanned Aerial Vehicle) Target drones are catapult launched eliminating the need for runways. The drones are fitted with the latest laser-tag combat systems including hit confirmation, text scoring and the NEW electronic ‘Flash Pods’ that simulate (AA) shell bursts. Hydraulically operated pedestal gun mount allows for high angle target engagement by the laser machine gunners. If your business is looking for action then order your Laser Gunner’s (AA) System now. The ultimate business venture that will bring nothing but excitement to your clients as they try and engage target drones flying past at up to 125mph (200kph). 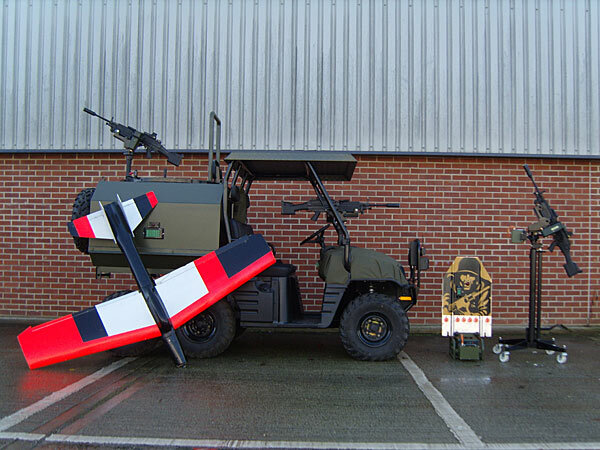 Large scale RC plane owners will be able to purchase AA combat kits for their aircraft in the near future adding more excitement to their hobby. 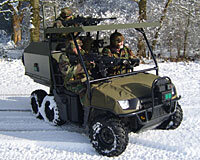 Ideal for military, cadet and civilian shooting ranges or corporate entertainment and leisure industry market. Can be used as an additional attraction to existing business. Eye safe class 1 lasers are used in lieu of bullets thus giving you a safe environment to operate in. 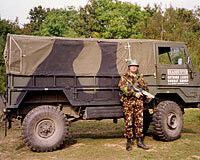 Minimum running costs as no expensive live ammunition is used. Radio activated pop-up and moving target systems with hit confirmation and text scoring. NEW (optional) electronic ‘Flash Pods’ that create simulated explosions without blowing up or damaging the target. Put that ‘WOW’ factor in to your shooting range. Laser-tag weapons and targets are easy to transport and set up making them ideal for a new mobile business venture in the leisure market. 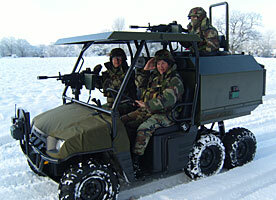 Low running costs as weapons and target systems are run on rechargeable battery power. More equipment can easily be added as your business expands. Built to take laser-tag/combat to the next level Armatruk is fitted with the latest technology for on the move battle scenarios aimed at the leisure market, military or civilian training. Armatruk can record incoming and outgoing hits. To add even more realism to the games or training ‘Flash Pods’ (simulated explosions) can be fitted to the vehicles. 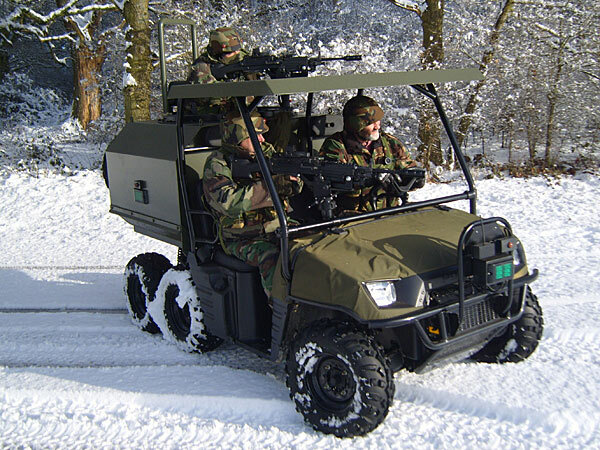 Armatruk’s patented design Gun Turret and equipment fitted to the Polaris Ranger 6x6 chassis makes it an ideal gun platform. In snow or dessert terrain you can go almost anywhere. The Turret Gunner has a 360 degree field of fire enabling him to engage targets from all angles. 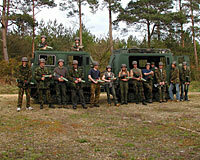 Thinking of the ultimate new business venture, why not try Armatruk, laser combat with a difference. Give your clients the luxury of riding into action, create real-time behind the lines gaming scenarios based on special ops vehicles (SOV), ideal for team building. 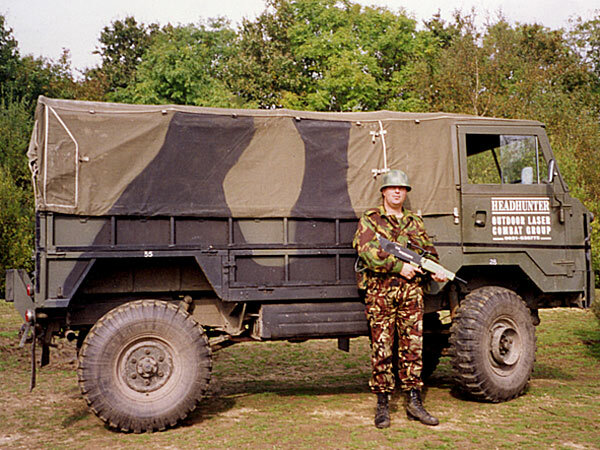 Company Director Mr Ross Stark set up England’s first outdoor laser combat games business back in 1991 under the name of Headhunters. 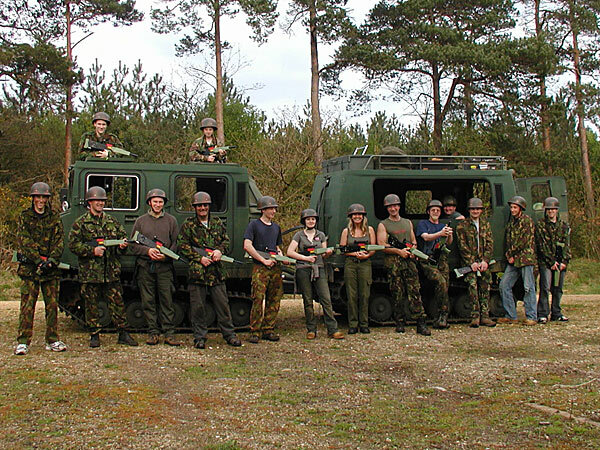 Using 42 specially developed outdoor laser guns and helmets, games were played at various locations around the Isle of Wight. Then shortly after a permanent site was established at Briddlesford Road, near Newport. This site is still in operation today though Mr Stark no longer owns it. In 2000 a new cordless laser gun system was developed using an infra-red link between gun and helmet. 2006 Development work starts on Armatruk. 2009 First Armatruk rolls of production line. 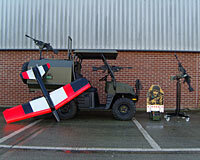 2009 Development work starts on Laser Gunners, new surface to air laser gunnery games and shooting range target systems. 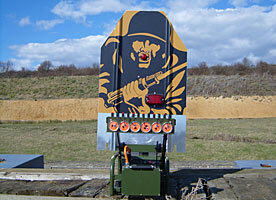 2012 Laser (AA) and shooting range target systems go through final testing. 2013 Laser Gunners launch their latest shooting range target and laser-tag (AA) combat systems which should keep them ahead of the airsoft and paintball market in this type of outdoor gaming.